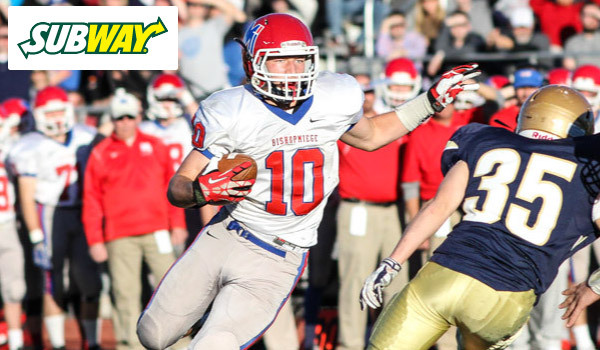 On the Week 4 edition of the Subway Friday Fresh Take, we’ll recap some of the state’s top games featuring ranked opponents and highlight a few other notes from Friday’s action. Bishop Miege took advantage of several St. Thomas Aquinas mistakes in scoring 27 points in the second quarter en route to a 41-21 win. The Stags, ranked No. 1 in Class 4A-I, welcomed the return of all-state running back Dawson Downing on Friday night. Downing missed last week’s 42-35 loss to Blue Valley after being injured in Week 2. He scored the Stags’ first three touchdowns in this game to give Miege a 21-7 lead. The momentum further grew in Miege’s favor when Joe Watskey picked up a blocked Aquinas punt and returned it for a touchdown with 1:02 remaining in the half to extend the Stag lead to 27-7. On the ensuing possession, Aquinas quarterback Karter Odermann was intercepted by Dylan Downing setting up Miege with approximately 25 seconds remaining in the half. Quarterback Carter Putz then hit Jafar Armstrong on a touchdown pass with 12 seconds in the half to put Miege up 34-7. The Stags got the ball to open the third quarter and Putz connected with Armstrong again to lead 41-7. Aquinas continued to grind out yardage on the ground behind a strong game from James Cosentino who finished with 191 rushing yards on 23 attempts. Touchdown runs from Oderamann and Sam Raemakers pulled Aquinas to within 41-21 early in the fourth quarter, but Miege would hold on for the 20-point win. Putz completed 18 of 26 passes for 276 yards and two scores. Downing rushed for 112 yards and had three receptions for 56 yards. Danny Murphy led Miege with five catches for 97 yards, while tight end Nolan Gray caught five for 79. Shawnee Mission East scored 21 points in the second quarter to build a lead and then pulled away from Shawnee Mission West, 42-21. Lancer quarterback Luke Kaiser hit Zach Yeo on a touchdown pass to start the scoring, and then rushed for a third quarter score to build the lead to 21 points. Wyatt Edmisten added a pair of touchdown runs for SM East, and the defense got in on the act as Luke Heisdorffer (6-4, 248) returned a fumble 24 yards for a score. Shawnee Mission West was led by Zach Witters who rushed for a touchdown and threw two touchdown passes. One week after losing a hard-fought 27-20 showdown at 5A No. 1 Mill Valley, Derby responded with a 49-14 blowout victory over 6A No. 4 Hutchinson. The game didn’t necessarily start out in ideal fashion for Derby. Panther quarterback Brady Rust broke a 70-yard touchdown run on the first play from penalty only to see it negated by a penalty. Shortly after, Hutchinson’s Marcus Tafolla intercepted a Rust pass and returned it 80 yards for a touchdown and a 6-0 Salthawk lead. Rust was then sacked on Derby’s next possession and the Panthers were forced to punt. But the senior quarterback would respond late in the first quarter when he hit Kai Lemons on a 28-yard touchdown pass to give the Panthers a 7-6 lead. They would never look back. Rust hit Kenyon Taber on a 32-yard touchdown and Garrett Xanders would score on a 12-yard run to put the Panthers up 21-6 at halftime. Xanders and Rust each would break long touchdown runs in the third quarter to put Derby up 35-6. Rust would add a score in the fourth quarter for a 42-14 lead. Rust rushed for 160 yards in the game, while Xanders added 145 on the ground. Scott City took advantage of three Holcomb turnovers to edge the Longhorns 15-7 in a battle of ranked Greater Western Activities Conference members. The Beavers, ranked second in Class 3A, beat the 4A-II No. 3 Longhorns for the eighth consecutive time. A controversial Holcomb pass from Trey Teeter to Braden Showalter was ruled a lateral with Scott City returning the ball to the Longhorn 30 yard line. Cooper Griffith scored shortly after to put Scott City up 6-0 late in the second quarter. Later, a Drake McRae interception of Teeter gave Scott City the ball in good field position. Griffith found the end zone again to put the Beavers up 12-0 in the third quarter. Teeter pulled his team within 12-7 on a touchdown pass to Conner VanCleave with one minute remaining in the third quarter. Scott City would add a 37-yard field goal by Tre Stewart with 10:15 remaining to lead 15-7. The Beaver defense held off Holcomb the rest of the way to secure the win. Griffith rushed for 105 yards on 19 carries to go with his two scoring runs. In the fan’s choice for Kpreps Game of the Week, 4A-I No. 2 Buhler pulled away from previously unbeaten Augusta, 47-21. Dillon Engelland rushed for 173 yards and four touchdowns in the first half as the Crusaders built a 28-14 lead at the break. His 74-yard touchdown run with: 06 seconds remaining in the first half provided the Crusaders the momentum at the half. Augusta pulled to within in a score in the third quarter as Luke Dockers broke a 64-yard touchdown run. With Engelland out in the third quarter due to illness, Buhler’s Dalton Brown scored on a 1-yard run to put the Crusader lead back at 14, 35-21. Augusta was then turned away on downs in Buhler territory on the next possession. After a Buhler punt, Jack Goertzen picked off an Augusta pass and returned it 35 yards for a touchdown and a 41-21 Buhler lead. Paola beat Frontier League rival Louisburg for the fifth consecutive time on Friday night, rallying from a halftime deficit for an 11-10 win. Louisburg entered the game unbeaten at 3-0 and took a 7-3 lead into halftime after Austin Terry hit Cole Kramer on a 62-yard touchdown pass. After a Paola fumble, the Wildcats extended their lead to 10-3 on an Alex Dunn field goal on the final play of the third quarter. Mid-way through the fourth quarter, Paola quarterback Ryan Gleghorn scored on a two-yard run to pull the Panthers within 10-9. Paola Coach Mike Dumpert decided to go for the two-point conversion and the lead. The Panthers got the conversion and grabbed an 11-10 lead with 5:15 remaining. Louisburg mounted one final threat driving into Paola territory with 2:30 remaining, but the Wildcats were unable to convert on a fourth-and-4 at the Paola 44 yard line. The outcome of this rivalry was decided by less than ten points for the fourth consecutive season. Paola won 20-14 last season, 23-17 in two overtimes in 2013, and 14-7 in 2012. Class 2-1A’s second-ranked Smith Center Redmen used a big first half and held off Mid Continent League rival Norton, 27-14. Chase Ryan rushed for all four touchdowns for Smith Center including three in the first half as the Redmen built a 21-2 lead. Norton’s first half points came when Smith Center snapped the ball over the quarterback’s head and through the end zone for a safety. Norton pulled to within 21-14 in the third quarter after touchdown runs from Tevin Petrie and Jordan Dole, but Bluejay quarterback Jace Ruder was intercepted twice in the fourth quarter to thwart any comeback attempt. The win by Smith Center at home marks the seventh consecutive win by the home team in this series. Ashland outscored Ingalls 22-0 in the third quarter to turn a 26-22 halftime deficit into a 44-26 lead heading into the final period. The Blue Jays then answered a pair of Ingalls touchdowns in the fourth quarter to complete a 56-42 upset of the Bulldogs, ranked No. 4 in 8-Man II. Kole Konrade rushed for 133 yards and three touchdowns and added 127 receiving yards and another score to pace Ashland. Konrade’s 70-yard touchdown run in the fourth quarter increased his team’s lead to two scores after Ingalls had pulled to within 50-42. Branson Sandoval rushed for 125 yards and three touchdowns for Ingalls. Wallace County used a big first half from senior quarterback Eric Gfeller to build a 38-12 lead in winning at Hoxie, 48-18. The Wildcats picked up a key win in District 8 of Eight-Man, Division II. Gfeller passed for 172 yards and three touchdowns in the first half, including 162 yards and two scores to Spencer Medina. Gfeller also finished with 171 yards rushing and three more touchdowns. Friday’s win was the fifth straight for the Wildcats over the Indians. Osawatomie senior running back Riley England carried 18 times for 487 yards and six touchdowns as the Trojans beat Iola 47-19. With Friday’s performance, England pushed his season rushing total to 1,044 yards and 10 touchdowns on 86 carries. For his career, England has 4,894 rushing yards and 52 touchdowns. Dodge City quarterback Caden Walters scored by rushed for four touchdowns and passed for four more in a 69-0 shutout of Liberal. Walters rushed for three touchdowns in the first half as the Red Demons built a 41-0 lead. After halftime, Walters tossed two touchdown passes and rushed for another. He tossed touchdown passes to four different receives. Maize South knocked 4A-I No. 4 Andover Central from the ranks of the unbeaten with a 51-41 shootout victory. With a lot of rain falling in North Central Kansas, Marysville upset 4A-II No. 5 Clay Center 6-3 in overtime. In Eight-Man, Division II, Pike Valley beat No. 5 Beloit St. John’s-Tipton 30-18. Pike Valley sat just outside the Kpreps 8-Man II poll last week.